This week begins with the the steady passion of the entrepreneurial spirit. What is it you are working for and wanting to create? 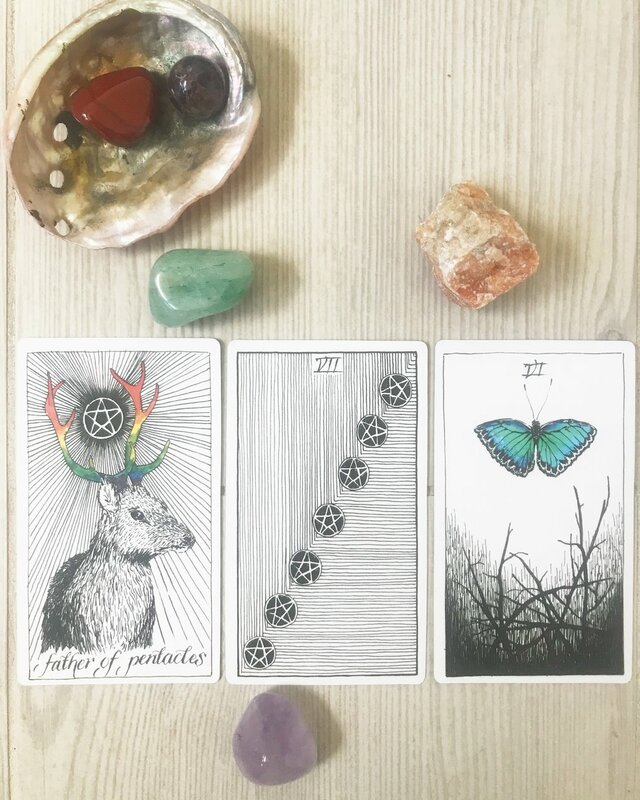 Use the energy from the Father of Pentacles to create your dreams. "The Father of Pentacles is a steady, gentle man. Upon first meeting, he can almost seem dull because of his extremely calm temperament. But underneath is an incredible passionate man who prioritizes the stability of his job, family and home. He is entrepreneurial and diligent at work. A true pleasure to know." After laying your foundation on Monday and Tuesday it is time for a period of contemplation. This card comes at a perfect time as the New Moon arrives on the 11th so we have a last chance to peel back any layers that are no longer serving us as well as begin to think about what it is we want to bring into this next moon cycle. "A curious card, the seven of Pentacles shows a period of contemplation and uncertainty. You're looking back at all of your hard work and wondering if it has been a failure or success. You can't seem to decide. Shouldn't you be reaping more rewards by now? Maybe so. But the mind has control over perception. It's possible your rewards are waiting for you to recognize them. They are not always monetary." You have made it through the building and contemplation phases of the week and we are moving right into a weekend of victory, success and rising up! Now that you have found your clarity it is time to rise up, dig in and do the work! The universe and the new moon on Saturday is supporting you, now its just up to you to get to work. "From the dark and tangled branches emerges a butterfly. New life takes flight. If you're not reveling in the joy of success already, you will be soon. The six of wands is a card of victory, of rising up against the odds. The obstacles have been relentless, but now is not the time to look back upon them. The more pressing question is: Where will you go with your new set of wings?" Have a great week my butterflies its time for you to spread your wings and fly!!! !